The Lenovo Vibe K4 Note Bundles Powerbank, AntVR And Skullcandy Headset For A Limited Time! Home / lenovo / mobile / news / The Lenovo Vibe K4 Note Bundles Powerbank, AntVR And Skullcandy Headset For A Limited Time! Good news! 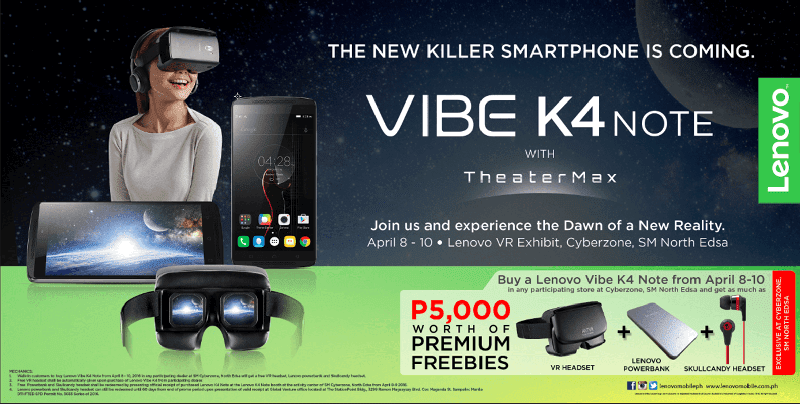 Those who'll grab the Lenovo Vibe K4 Note will get several freebies worth 5,000 Pesos this coming April 8 to 10, 2016 at SM North EDSA Cyberzone only. The items included with Lenovo's new killer handset are the following: Powerbank, AntVR And Skullcandy Headset. In case you missed it, the K4 Note is the highly anticipated follow-up to the successful Lenovo A7000 Plus. It features fantastic multimedia features that comes with TheaterMax, Lenovo VR technology that allows you to view widescreen movies and play VR games. The Lenovo Vibe K4 Note retails at 10,699 at Villman right now which could also be the actual price during its launch / promo duration. If that's the case, it's a great great deal.